Neuroblastoma is a type of cancer that usually originates either in the tissues of the adrenal gland or in the ganglia of the abdomen or in the ganglia of the nervous system. (Ganglia are masses of nerve tissue or groups of nerve cells.) Tumors develop in the nerve tissue in the neck, chest, abdomen, or pelvis. Neuroblastoma is one of the few cancer types known to secrete hormones. It occurs most often in children, and it is the third most common cancer that occurs in children. Approximately 7.5% of the childhood cancers diagnosed in 2001 were neuroblastomas, affecting one in 80,000 to 100,000 children in the United States. Close to 50% of cases of neuroblastoma occur in children younger than two years old. The disease is sometimes present at birth, but is usually not noticed until later. By the time the disease is diagnosed, it has often spread to the lymph nodes, liver, lungs, bones, or bone marrow. Approximately one-third of neuroblastomas start in the adrenal glands. According to some reports, African-American children develop the disease at a slightly higher rate than Caucasian children (8.7 per million compared to 8.0 per million cases diagnosed). The causes of neuroblastoma are not precisely known. Current research holds that neuroblastomas develop when cells produced by the fetus (neuroblast cells) fail to mature into normal nerve or adrenal cells and keep growing and proliferating. The first symptom of a neuroblastoma is usually an unusual growth or lump, found in most cases in the abdomen of the child, causing discomfort or a sensation of fullness and pain. Other symptoms such as numbness and fatigue, arise because of pressure caused by the tumor. Bone pain also occurs if the cancer has spread to the bone. If it has spread to the area behind the eye, the cancer may cause protruding eyes and dark circles around the eyes; in a few cases, blindness may be the presenting symptom. Or paralysis may result from compression of the spinal cord. Fever is also reported in one case out of four. High blood pressure, persistent diarrhea, rapid heartbeat, reddening of the skin and sweating occur occasionally. Some children may also have uncoordinated or jerky muscle movements, or uncontrollable eye movements, but these symptoms are rare. If the disease spreads to the skin, blue or purple patches are observed. A diagnosis of neuroblastoma usually requires blood and urine tests to investigate the nature and quantity of chemicals (neurotransmitters) released by the nerve cells. These are broken down by the body and released in urine. Additionally, scanning techniques are used to confirm the diagnosis of neuroblastoma. These techniques produce images or pictures of the inside of the body and they include computed tomography scan (CT scan) and magnetic resonance imaging (MRI). To confirm the diagnosis, the physician will surgically remove some of the tissue from the tumor or bone marrow (biopsy), and examine the cells under the microscope. The treatment team usually consists of an oncologist specialized in the treatment of neuroblastoma, a surgeon to perform biopsies and possibly attempt surgical removal of the tumor, a radiation therapy team and, if indicated, a bone marrow transplantation team. Once neuroblastoma has been diagnosed, the physician will perform more tests to determine if the cancer has spread to other tissues in the body. This process, called staging, is important for the physician to determine how to treat the cancer and check liver and kidney function. The staging system for neuroblastoma is based on how far the disease has spread from its original site to other tissues in the body. Localized resectable (able to be cut out) neuroblastoma is confined to the site of origin, with no evidence that it has spread to other tissues, and the cancer can be surgically removed. Localized unresectable neuroblastoma is confined to the site of origin, but the cancer cannot be completely removed surgically. Regional neuroblastoma has extended beyond its original site, to regional lymph nodes, and/or surrounding organs or tissues, but has not spread to distant sites in the body. Disseminated neuroblastoma has spread to distant lymph nodes, bone, liver, skin, bone marrow, and/or other organs. Stage 4S (or IVS, or "special") neuroblastoma has spread only to liver, skin, and/or, to a very limited extent, bone marrow. Recurrent neuroblastoma means that the cancer has come back, or continued to spread after it has been treated. It may come back in the original site or in another part of the body. Surgery is used whenever possible, to remove as much of the cancer as possible, and can generally cure the disease if the cancer has not spread to other areas of the body. Before surgery, chemotherapy may be used to shrink the tumor so that it can be more easily removed during surgery; this is called neoadjuvant chemotherapy. Radiation therapy is often used after surgery; high-energy rays (radiation) are used to kill as many of the remaining cancer cells as possible. Chemotherapy (called adjuvant chemotherapy) may also be used after surgery to kill remaining cells. Bone marrow transplantation is used to replace bone marrow cells killed by radiation or chemotherapy. In some cases the patient's own bone marrow is removed prior to treatment and saved for transplantation later. Other times the bone marrow comes from a "matched" donor, such as a sibling. One novel approach to treatment of neuroblastomas is therapy with desferoxamine (DFO), which is ordinarily used to treat iron poisoning. DFO has been shown to have antitumor activity in neuroblastomas and other cancers of the central nervous system. It is thought that the drug works by lowering the increased iron levels in the body associated with cancer. As of 2004, there are significant differences in treatment protocols for neuroblastoma between the major North American study group (Children's Oncology Group) and its European counterpart, the Société Internationale d'Oncologie Pédiatrique (SIOP). These differences include biopsy techniques, the timing and extent of surgery, chemotherapy dosages, and the types of salvage therapy employed. No alternative therapy has yet been reported to substitute for conventional neuroblastoma treatment. Complementary therapies—such as retinoic acid therapy—have been shown to be beneficial to patients when administered after a conventional course of chemotherapy or transplantation. The chances of recovery from neuroblastoma depend on the stage of the cancer, the age of the child at diagnosis, the location of the tumor, and the state and nature of the tumor cells evaluated under the microscope. Infants have a higher rate of cure than do children over one year of age, even when the disease has spread. In general, the prognosis for a young child with neuroblastoma is good: the predicted five-year survival rate is approximately 85% for children who had the onset of the disease in infancy, and 35% for those whose disease developed later. Neuroblastoma may be a genetic disease passed down from the parents. In 2004, a group of German researchers reported that a series of neuroblastomas demonstrated a consistent pattern of deletions and overrepresentations on chromosomes 3, 10, 17q, and 20. There is currently no known method for its prevention. After completion of a course of treatment for neuroblastoma, physicians sometimes recommend that the child undergo an investigative operation. This procedure allows the treatment team to evaluate how effective treatment has been, and may offer an opportunity to remove more of the tumor if it is still present. Adjuvant chemotherapy — Treatment of the tumor with drugs after surgery to kill as many of the remaining cancer cells as possible. Adrenal gland — Gland located above each kidney consisting of an outer wall (cortex) that produces steroid hormones and an inner section (medulla) that produces other important hormones, such as adrenaline and noradrenaline. Alternative therapy — A therapy is generally called alternative when it is used instead of conventional cancer treatments. Biopsy — A small sample of tissue removed from the site of the tumor to be examined under a microscope. Complementary therapy — A therapy is called complementary when it is used in addition to conventional cancer treatments. Conventional therapy — Treatments that are widely accepted and practiced by the mainstream medical community. Disseminated — Spread to other tissues. Hormone — A substance produced by specialized cells that affects the way the body carries out the biochemical and energy-producing processes required to maintain health (metabolism. Localized — Confined to a small area. Monoclonal antibody — A protein substance which is produced in the laboratory by a single population of cells. They are being tested as a possible form of cancer treatment. Neoadjuvant chemotherapy — Treatment of the tumor with drugs before surgery to reduce the size of the tumor. Neuroblast cells — Cells produced by the fetus which mature into nerve cells and adrenal medulla cells. Resectable cancer — A tumor that can be surgically removed. Salvage therapy — Treatment measures taken late in the course of a disease after other therapies have failed. It is also known as rescue therapy. Staging system — A system based on how far the cancer has spread from its original site, developed to help the physician determine how best to treat the disease. Unresectable cancer — A tumor that cannot be completely removed by surgery. Alexander, F. "Neuroblastoma." Urol. Clin. North. Am. 27, August 2000, pp. 383-92. Beers, Mark H., MD, and Robert Berkow, MD., editors. "Neuroblastoma." Section 19, Chapter 266 In The Merck Manual of Diagnosis and Therapy. Whitehouse Station, NJ: Merck Research Laboratories, 2004. Alexander, F. "Neuroblastoma." Urol. Clin. North. Am. 27 (August 2000): 383-392. Berthold, F., and B. Hero. "Neuroblastoma: current drug therapy recommendations as part of the total treatment approach." Drugs 59 (June 2000): 1261-1277. Bockmuhl, U., X. You, M. Pacyna-Gengelbach, et al. 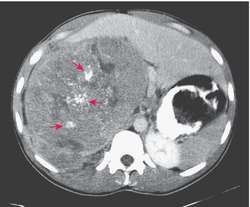 "CGH Pattern of Esthesioneuroblastoma and Their Metastases." Brain Pathology 14 (April 2004): 158-163. Dayani, P. N., M. C. Bishop, K. Plack, and P. M. Zeltzer. "Desferoxamine (DFO)—Mediated Iron Chelation: Rationale for a Novel Approach to Therapy for Brain Cancer." Journal of Neurooncology 67 (May 2004): 367-377. Grosfeld, J. L. "Risk-based management of solid tumors in children." American Journal of Surgery 180 (November 2000):322-327. Lau, J. J., J. D. Trobe, R. E. Ruiz, et al. "Metastatic Neuroblastoma Presenting with Binocular Blindness from Intracranial Compression of the Optic Nerves." Journal of Neuroophthalmology 24 (June 2004): 119-124. Morgenstern, B. Z., A. P. Krivoshik, V. Rodriguez, and P. M. Anderson. "Wilms' Tumor and Neuroblastoma." Acta Paediatrica Supplementum 93 (May 2004): 78-84. Pinkerton, C., R. Blanc, M. P. Vincent, C. Bergeron, B. Fervers, and T. Philip. "Induction chemotherapy in metastatic neuroblastoma—does dose influence response? A critical review of published data standards, options and recommendations (SOR) project of the National Federation of French Cancer Centres (FNCLCC)." European Journal of Cancer 36 (September 2000): 1808-1815. The American Cancer Society. "After Diagnosis: A Guide for Patients and Families." "Caring for the Patient with Cancer at Home." "Understanding Chemotherapy: A Guide for Patients and Families." "Understanding Radiation Therapy: A Guide for Patients and Families." National Cancer Institute. Office of Cancer Communications, 31 Center Drive, MSC 2580, Bethesda, MD 20892-2580. 800-422-6237. http://cancernet.nci.nih.gov/clinpdq/pif/Neuroblastoma_Patient.html. National Institutes of Health & National Cancer Institute. Young People With Cancer: A Handbook for Parents. http://www.cancernet.nci.nih.gov/young_people/yngconts.html. sarcoma of nervous system origin, composed chiefly of neuroblasts, affecting mostly infants and children up to 10 years of age, usually arising in the autonomic nervous system (sympathicoblastoma) or in the adrenal medulla. A malignant neoplasm characterized by immature, only slightly differentiated nerve cells of embryonic type, that is, neuroblasts; typical cells are relatively small (10-15 mcm in diameter) with disproportionately large, darkly staining, vesicular nuclei and scant, palely acidophilic cytoplasm; they may be arranged in sheets, irregular clumps, or cordlike groups, as well as occurring individually and in pseudorosettes (with nuclei arranged peripherally about the centrally directed cytoplasmic processes); ordinarily, the stroma is sparse, and foci of necrosis and hemorrhage are not unusual. Neuroblastomas occur frequently in infants and children in the mediastinal and retroperitoneal regions (approximately 30% associated with the adrenal glands); widespread metastases to the liver, lungs, lymph nodes, cranial cavity, and skeleton are very common. /neu·ro·blas·to·ma/ (noor″o-blas-to´mah) sarcoma of nervous system origin, composed chiefly of neuroblasts, affecting mostly infants and young children, usually arising in the autonomic nervous system (sympathicoblastoma) or in the adrenal medulla. A malignant tumor composed of neuroblasts, originating in the autonomic nervous system or the adrenal medulla and occurring chiefly in infants and young children. a highly malignant tumor composed of primitive ectodermal cells derived from the neural plate during embryonic life. The tumor may originate in any part of the sympathetic nervous system but is most common in the adrenal medulla. Neuroblastomas metastasize early and widely to lymph nodes, liver, lungs, and bone. Symptoms may include an abdominal mass, respiratory distress, and anemia. Hormonally active adrenal lesions may cause irritability, flushing, sweating, hypertension, and tachycardia. Before metastasis, treatment with radical surgery, irradiation, and chemotherapy are often successful. Spontaneous remissions may occur, with the tumor undergoing maturation and forming a benign ganglioneuroma. A kind of neuroblastoma is Pepper's syndrome. Oncology A highly malignant childhood tumor of adrenal or related tissue in the nervous system, derived from neural crest, which is composed of undifferentiated neuroblasts; it is the 2nd most common pediatric neoplasm after leukemia and lymphoproliferative disorders Clinical Median age of onset < age 2; stage I survival is 80-90%, stage IV, 15%–stage IV-S is an exception, and has a better prognosis; higher stage neuroblastomas metastasize to bone, lymph nodes, liver Lab Catecholamines and metabolites are ↑ by TLC, GLC, HPLC, with a 5-fold ↑ in VMA and HVA Prognosis Better with stage I, II, or IVa disease, younger age–< 1 yr, ↑ TRK–protein product of proto-oncogene TRK. See Esthesioneuroblastoma, Ganglioneuroblastoma, Homovanillic acid, Intraventricular neuroblastoma, Nerve growth factor receptor, 'One-hit, two-hit' model, TRK, Vanillylmandelic acid. A malignant neoplasm characterized by immature nerve cells of embryonic type (e.g., neuroblasts); the stroma is sparse and foci of necrosis and hemorrhage are not unusual. Neuroblastomas occur frequently in infants and children in the mediastinal and retroperitoneal regions; widespread metastases to the liver, lungs, lymph nodes, cranial cavity, and skeleton are common. A highly malignant tumour derived from the cells that normally develop into nerve tissue. The tumour is composed of small, darkly staining cells often arranged around a central core of tangled fibrillary material to form rosettes. The neuroblastoma occurs mainly in the ADRENAL MEDULLA of children under the age of 4. Malignant neoplasm characterized by immature, only slightly differentiated nerve cells of embryonic type, i.e., neuroblasts. n a malignant neoplasm characterized by proliferating nerve cells. rare neoplasm arising from primitive neuroepithelial cells which differentiate toward neuroblasts (neuroblastoma) or neurons (ganglioneuroma). They usually arise in the central or autonomic nervous system or in the adrenal medulla (sympathicoblastoma). The high-risk neuroblastoma is a nasty beast and is very good at going to the bones and bone marrow. html) American Cancer Society , neuroblastoma is the most common form of cancer in infants. 1 Neuroblastoma (NB) is an embryonic tumour of the sympathetic nervous system, occurring primarily in children under the age of 5 years, and is characterised by early metastasis. This formulation induced substantial cell death in neuroblastoma cells while producing no or only minor toxicity in healthy cells. If doctors could be confident which patients in this particular subgroup of intermediate risk neuroblastoma were likely to relapse, then providing more intense treatment upfront could potentially save these children. Neuroblastoma is a form of cancer that originates from immature neural crest cells and can manifest as a primary tumor anywhere throughout the sympathetic nervous system. Table-II: Histological features of Olfactory neuroblastoma. However, its potential against neuroblastoma dissemination is not explored yet. Research dates to the 1990s, when scientists first found that stem-cell transplants improved survival better than chemotherapy alone against neuroblastoma and other cancers. When there was no option left.. These tumours were originally classified according to a classification system by Shimada et al, which was subsequently clarified and adopted for use globally by The International Neuroblastoma Pathology Committee-INPC System 11 proposed in 1999 and revised in 2003.